The Third Battalion Rangers which was based in Taiping, Perak was frequently involved in Operations, all over Malaysia. One operation of significant historical importance was “Operation Radak”. This operation was launched in the Bukit Besar area of Kulim, Kedah on the 14th May 1971. This operation was a special operation launched against the 8th Assault Unit of the Malayan Communist Party, which was actively operating in Kedah. This enemy unit was hunted by most units of the Malaysian Armed Forces for a number of years without success that one could be proud about. From the beginning no one was sure of the 8th Assault Unit’s location. They were believed to be always on the move. Based on information derived from the Special Branch and the civilian population this special operation was launched. One fine day information was received concerning the Enemy’s camp. Many months were spent planning this operation. On the 9th May, the Intelligence guys got some information that a group of seven enemy would be meeting at Bukit Besar, Kulim on the 14th May 1971, after which they would set up camp in that area. There was an emergency meeting held by the Commanding Officer of 3rd Rangers, who was Lt Col Looi Kum Chung. This meeting was attended by all officers and senior NCO’s for the purpose of getting feedbacks on the best way to conduct the operations. This was a brain storming session. The CO made a decision to search and destroy the enemy location, using one search and attack group and a number of cordon groups. The Operation was named RADAK. (STAB). On the 11th May Intelligence agents confirmed that the enemy would meet on the 14th May. The intelligence gave details that there would be two women and six men. They would base up at that location after that meeting. To make this complex operation simple it was broken into stages. The first stage was to reconnoiter the entry route by the Intelligence group. The second stage for the cordon groups to move in. The third stage for the search and destroy groups to be inserted. The fourth stage being the search stage and the fifth stage which was the final stage, the attack stage. The Intelligence group was headed by 2Lt Sueelan al Selvarajah, with two of his men who were 928356 Cpl Hamid bin Matin and Cpl Awang Ahmad bin Awang Kassim. They moved into the operational area on the 14th May 1971 at 0600 hours, to identify the route to be used by the attack group. During this insertion all were dressed in civvies and all their weapons were hidden. All the other groups were similarly attired. The groups moved off from Taiping using different routes at different times, to arouse the least suspicion. When the groups arrived at the debussing points they quickly moved into the jungle, moving towards their designated points. The cordon group was made up of 3 Rifle Companies from the 3rd Rangers, 1 mixed group of admin staff, drivers, cooks, two Companies from the 9th Battalion Royal Malay Regiment under the command of 3rd Rangers and 1 Company at the end of the operation from the 13th Battalion Royal Malay Regiment. The attack groups too deployed to the staging area. In the 3rd stage, the attack groups moved in at 0030 hours after midnight to the ‘start line’. This group arrived at the start line at 0500 hours on the 15th May 1971. The group shook up into a sweep formation and ready to conduct the sweep in an extended line. 4th stage, the groups started their sweep as soon as the sun arose. 5th stage would be launched as soon as the enemy location was sighted. This stage was never implemented as planned, as the attack was carried out by a smaller group, led by 2lt Kassim from Platoon 1. 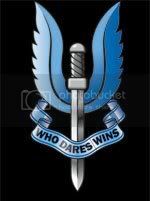 The search and assault group that was given the responsibility to destroy the enemy was A Company, commanded by Captain M.F. Nesaretnam (later Colonel, passed away). All the three platoon commanders in this group were specially selected. They were 2Lt Kassim of Platoon 1. He was actually the Adjutant, the sad part was he was recalled from his holidays while he was on a honeymoon. Platoon No2, was commanded by Lt Wong Sing Nang, who was also the 2IC of A Company. Platoon No. 3 was commanded by 2Lt Abang Ali bin Badrin, who happened to be the unit’s Mechanical Transport Officer (MTO). Another group of Special Grade Agents (SGA), comprising of surrendered enemy, was commanded by Major Ong Hook Teik. At the beginning of the operations the cordon group comprised of 5 companies of infantry. From 3rd Rangers, it was B Company, C Company, D Company and Headquarters Company. From 9th RMR was A Company commanded by Captain Saidi bin Zakaria (12354) and C Company from 10 RMR commanded by Captain Kamaruddin bin Mattan (410213). After the attack was launched 3 more companies came in, they were B Company, 10th RMR, commanded by Captain Lt Kamarulzaman bin Md Nor (410102) and C Company of 13th RMR commanded by Captain Md Soud bin Paimun (3357). The doctor involved in this operations was Captain (Dr.) Jasbir Singh. The Cordon Group pushed off from Taiping at 2205 hours at night and reached it’s destination at Batu Sembilan, Jalan Serdang-Kilang Lama at GR VD 585316 at 0100 hours in the morning on the 15th May. They were in position by 0630 hours. After the Cordon Group was in position, the Battalion Tactical Headquarters and the Assault Company (A company), shook up into assault formations. Platoon 1 was the left assault platoon, with Platoon 2 in the center, Platoon 3 being the right assault platoon, with the Company Headquarters behind Platoon2, immediately behind Company Headquarters was the Battalion Tactical Headquarters. They were ready for the sweep, to move in an easterly direction. On the morning of 15th May all the groups were determined to close up with the enemy. As soon as first light broke, they moved forward to conduct the search. They had not slept at all the previous night. For a climax, they only consumed cold water and dry biscuits for breakfast before their daunting task. According to their plans they were supposed to hit the enemy camp, before 0800 hours that morning. The time passed without anyone encountering any enemy. Platoon 2 saw a hut, which made it deviate from the original direction, where they found a woman and three children. It was located on a ridge, on the supposed enemy camp on the right. At that moment Corporal Awang Ahmad was the only person on the ridge. He saw a young Chinese woman run downhill. Cpl Awang Ahmad managed to capture her. The quick thinking Corporal called out for his platoon commander, Lt Wong, who was out of earshot. It was 2Lt Kassim who heard the calls. He halted his advancing platoon, to conduct a reconnaissance on the ridge, with his 12 men. He saw Cpl Awang Ahmad with the captured young woman. He saw that not far from them was a vegetable plot, his mind immediately registered that it was the Enemy’s vegetable plot. When questioned, being interrogated, the woman was stubborn and uncooperative. She just kept on repeating that she did not know how to speak Malay. Kassim suspected that the enemy camp was not far off. He sent for the SGA group under the command of Major Ong Hoon Teik. He wanted the SGA group who were fluent in Chinese dialects to interrogate the young woman. Major Ong failed in getting anything out of her. The SGA confirmed that she was an unarmed lookout along with her family for the Communists at the camp. She ran downhill to warn them of the approaching security forces. Major Ong assessed that the enemy camp was very near their vicinity. Major Ong ordered 2Lt Kassim to guard the woman while he went forward to get more information via reconnaissance. All these happenings were reported to the Battalion Tactical Headquarters through the radio by 2Lt Kassim. Major Ong’s group had barely left 5 minutes, when at about 200 meters from Kassim’s location, Major Ong’s group was fired upon, with automatic weapons by the enemy's sentries. 2Lt Kassim straightaway ordered his batman and his signaler to guard the woman until relieved. With 9 men, he took off in the direction of the firing. As soon as he arrived at the location of the firefight he managed to make contact with Major Ong. The enemy failed to inflict any casualties on Major Ong’s intelligence group. Major Ong informed 2Lt Kassim that the enemy sentries had withdrawn to the foot of the hill. 2Lt Kassim informed Major Ong that he would pursue the enmy with his men. In an extended formation 2Lt Kassim and his men advanced uphill. Ranger Mereng ak Imang led the section, followed by 928206 Cpl Mohd Basri bin Abdullah. Ranger Mereng wanted to take a breather on top of the hill, as soon as he reached the top, he looked down and saw clothes hung up to dry below. He informed Cpl Mohd Basri. Very slowly Ranger Mereng inched down the terrace on the hill, which was covered by rubber trees. At first he thought he spotted the rolling machine to flatten the processed latex produce from the rubber trees. When he had completed his descent he realized that they were packs, laid out neatly on the terrace. When he realized that they were enemy packs he halted, as soon as he halted, he was fired upon by the enemy. He returned fire whilst standing while looking for a good place to take cover. He left his location after awhile to look for Cpl Basri, after meeting up with him they split up, with the Corporal going left and he himself going right. They were lucky that Cpl Basri went to the left as two of the enemy were preparing to attack them. Cpl Basri killed one of them with two rapid shots, while another managed to escape. The enemy at the bottom of the hill started firing uphill at Cpl Basri and Ranger Mereng. The rest of the group who were on top of the hill could not get to descend due to the intense fire from the enemy. 2Lt Kassim found out that the enemy was at the bottom of a very steep incline, which had a drop of around 20 feet. The easiest approach to the enemy’s location was to swing the attack to the left or the right of the hill. This course of action would take up too much time. He did not have much of a choice to close up with the enemy. He had to launch the attack from the top down the steep incline. If he looked for alternative routes the enemy would use this window of opportunity to escape from them. He calmly and with resolute confidence in his men gave his quick attack orders. He told his men to roll down the incline to launch the assault on the enemy. The situation being very difficult. Only 2Lt Kassim managed to roll down to where Ranger Mereng was. Ranger Mereng was carrying an HBSLR. Two of them were successfully positioned at the fringe of the enemy camp, 10 yards away from the perimeter of the enemy camp and the forward enemy trenches. 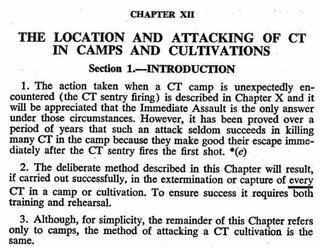 A British Army Manual on the conduct of an attack on a Communist Terrorist Camp. 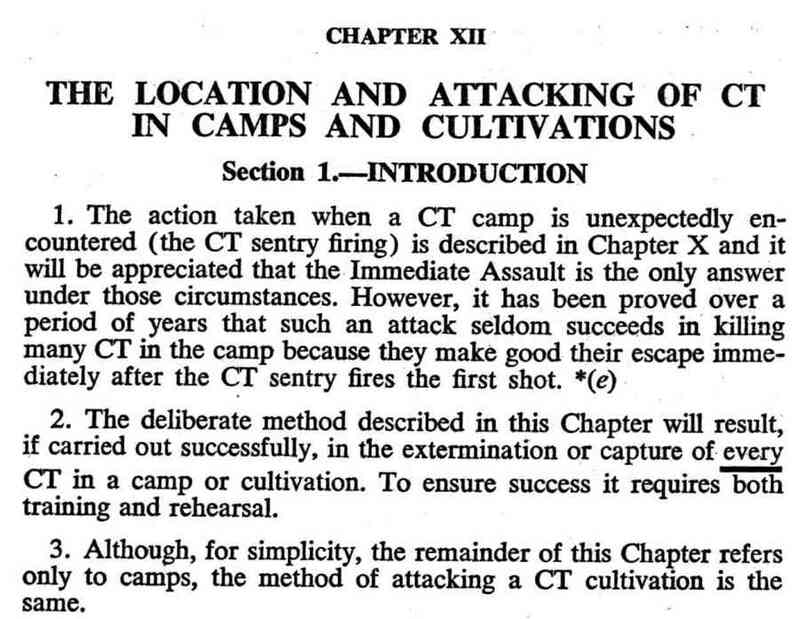 That's exactly what 2Lt Kassim did, not exactly the classic textbook attack but it did suffice. They were greeted with heavy enemy fire from the Eight Communist Terrorists. He directed Ranger Mereng to move to the right and engage the enemy from this new position. Rgr Mereng did as he was ordered, he crawled to his new position and opened up with his heavy barrel self loading rifle. Some of the enemy was taking cover behind stacked logs. The cover for 2Lt Kassim and Rgr Mereng was very limited, that is, no cover at all. Ammunition too was limited, Kassim had only 8 magazines with 20 rounds each and Rgr Mereng had 12 magazines with 30 rounds each. The intensity of the enemy fire made them feel very vulnerable. At that moment being in a very tight situation, the group that was left behind opened up with the GPMG (Mag 58) to the rear of the enemy camp, confusing the enemy. This quick thinking action saved them also prevented the enemy from abandoning their position. The two of them continued returning fire. Kassim yelled to the rest of his men to find a way to come down to his location. He also yelled at the enemy to surrender. To which the enemy yelled to one another, “Kill him! Kill him!” They yelled in Chinese. The enemy realizing that they were getting cornered increased the intensity of their fire. 2Lt Kassim and Rgr Mereng started paper potting (fire and movement) moving inch by inch towards the location of the enemy. The enemy tried out maneuvering them by moving to the right, to which 2Lt Kassim ordered Rgr Mereng to counter this by moving to the right of the enemy too. Rgr Mereng kept the enemy’s heads down by bringing concentrated fire upon the enemy. The enemy was pinned down as the two of them were firing in two different directions. To counter this, the enemy split into two groups. 2Lt Kassim who was armed with a SLR kept on firing which hit a number of the enemy. Rgr Mereng with his HBSLR was on full automatic continued firing with bursts. The enemy started suffering casualties. As the attack was being conducted by the two, at a critical moment, three of 2Lt Kassim’s men joined the fray. They were Cpl Basri, 928278 Rgr Mat Nor bin Hitam (batman) and 19505 Rgr Mustakin bin latif (Signaller), who manged to roll downhill. The woman prisoner was taken off their hands by Major Ong. The enemy who were thinking that they could finish off the two were suddenly confronted with an additional 3 determined Rangers. These 3 Rangers who rolled downhill, would not allow their comrade and their commander to face the odds all alone. 2Lt Kassim continued his advance towards the enemy, he had to stop as he ran into quite a number of trip wires. The enemy who survived fled dragging two of their wounded comrades. There were only 4 dead enemy that lay in front of them, whose bodies were mangled. Due to the large number of booby traps rigged all over the area the assault had to be halted, a follow up was too risky at that stage. 2Lt Kassim did the next best thing, he called all the cordon groups and informed them about the fleeing enemy, which he estimated at 4. He also informed them that two of them were wounded. After which he moved into the enemy camp. He started clearing the enemy’s booby traps. Three booby traps were successfully defused. They found the dead enemies weapons and packs. For the follow up Lt Wong Sing Nang was given the task., it was limited as they ran into the cordon. Even though Kassim was outnumbered by the enemy he had no choice but to attack, given that the terrain and situation was very unfavorable to him. By his sheer will, bravery and bloody mindedness he managed to turn the tables on the enemy, who were entrenched in a prepared position. He had the added advantage of having soldiers who were willing to follow him into the jaws of death. He managed to surprise and inflict casualties on the enemy. It was a big success for 3rd Rangers. Successes were indeed rare during that period in time. The patience in the cordon to paid off. At around 1720 hours in the evening Platoon No.9 commanded by 2Lt Jagdesh Singh Gill spotted 3 of the enemy, approaching the cordon. Along with Jagdesh Singh Gill were his platoon sergeant, 928059 Sgt Wan Ibrahim bin Md Ghanii, 928268 Cpl Mat Shah bin Said and a number of others. They were all concealed in an ambush position. They waited patiently for the enemy to come into the ‘killing area’. One of the enemy was seen wounded, aided by one of his comrades. These two walked straight into the ambush. Instant and simultaneous fire was brought to bear on the enemy. All two were killed at GR VD 264607, one enemy who was a woman escaped. Immediately after that, the OC of C Company Major George Edward Simon was directed to seek and destroy the fleeing woman terrorist. It was believed that she was wounded. There were two close encounters with them, she still managed to escape. Major G.E Simon however found the body of another dead enemy. A woman. It was believed that she died of wounds sustained in the attack by 2Lt Kassim. Major G.E. Simon conducted a two day search for the fleeing and wounded enemy. On the third day the search was halted as it was an unsuccessful search. The Operation RADAK was only planned to last for 24 hours, it had dragged on the 5 days. Therefore the soldiers were insufficiently equipped or supplied with food to last longer than two days. Even then, with only two days of supplies, they had stretched the operation into five days, that itself was commendable. What this meant was that, as the soldiers were lightly equipped , they did not have a change of clothing, no sleeping equipment and not enough food. They were on their feet throughout this operation. This particular operation reflected the high standards of discipline, perseverance adaptability and good leadership on the part of the sub unit commanders to have a successful outcome in a challenging situation. The exemplary leadership by 2Lt Kassim and the valour of Ranger Mereng enabled the unit to successfully kill 5 of the enemy, an additional two who ran into the ambush of 2Lt Jagdesh Sing Gill, due to the onslaught by Kassim and his group. The total number of kills was 7. This was a major success, they recovered equipment, weapons such as carbines, Thompson’s, Sten guns, pistols, 3 booby traps, hand grenades, 8 packs complete with clothing, two radios, a box of detonators, canned food, medicines, fresh rations and the most important of all documents. From these documents a total of 500 Communist supporters and active communists were identified and located. All 500 were arrested, due to this one singular fierce firefight led by 2Lt Kasim Abdul Kadir and Rgr Mereng ak Imang. Throughout the firefight Rgr Mereng constantly reminded 2Lt Kassim to be careful and not to get killed, he was fiercely loyal to his Platoon Commander. One of the Communists killed, was Chan Man Cheong, who was twice decorated for valor with Chairman Mao’s Bravery Award, for successes against Malaysian Security Forces. For gallantry in the face of the enemy in highest traditions of the Ranger Corps, 2Lt Kassim bin Abdul Kadir and Ranger Mereng ak Imang were both bestowed with the “Pingat Gagah Berani” by the King on the 7th June 1972. Cpl Basri, Rgr Mat Noor and Rgr Mustakin were conferred the “Kepujian Perutusan Keberanian”(Mentioned –In-Dispatches). Ranger Mereng was promoted to the rank of a Corporal in the field. The rest who were awarded the “KPK”(Mentioned-In Dispatches) were 2Lt Jagdesh Singh Gill, 2Lt Suseelan, Captain Edward Teh, Sgt Wan Ibrahim, 928268 Cpl Mohamad Shah bin said, Corporal Awang Ahmad and 928356 Cpl Hamid. *The Kepujian Perutusan Keberanian is conferred on members of the Armed Forces and the Royal Malaysian Police Force for acts of gallantry deserving recognition but not to the extent of meriting a decoration. The Kepujian Perutusan Keberanian can be conferred on a person more than once and for subsequent acts of gallantry a bar is added. The badge is in the form of a laurel leaf (palas design) and made of bronze. It is pinned to a ribbon of other awards received by the person. If he has not received any, the Kepujian Perutusan Keberanian can be pinned on the person's dress. It can also be pinned on a piece of cloth, which is of the same colour as the dress worn by the person at that time. The Kepujian Perutusan Keberanian was instituted on 29 July 1960 and gazetted on 11 August 1960. The source. 2Lt Kassim bin Abdul Kadir joined the Army as a Cadet Officer in July 1967. He was the first from his district to become an Officer in the Armed Forces. His father whose name was Abdul Kadir was a businessman. His grandfather was a Malayalee, an ethnic Indian. He joined Intake 12 of the Short Service Commission after finishing his Senior Cambridge in the Government English School, Labuan. He was commissioned as a 2Lt Lieutenant on the 23rd February 1968 into 3rd Rangers. He was born and grew up in Labuan. He left the service early in the interests of his family, as he believed that his children needed him more. The constant moves were taking a toll on his family. He had served his nation well, it was now time for his family. He loved the army and his Corps. He had attended various courses in the UK and Australia. He left the service with the rank of a Lt Col. Sadly Lt Col Kassim bin Abdul Kadir passed away on the 17th February 1993. He was buried at the Muslim Cemetery, Jalan Bukit Belacan, Lembah Jaya, Ampang, Selangor. Ranger Mereng ak Imang, a Kayan from Long Seinei, Sungei Akah, Baram Sarawak, was born on the 15th May 1948. He was the youngest of two children in the family of Imang Jau, his father and his mother Do Imang.He received his early schooling at the Bukit Sabun Primary School, Long Lama Baram. He completed his Standard 6. He joined the army on the 1st July 1967. He joined the army as felt that he could do well in the profession of arms. He did 4 months of recruit training before joining 3rd Rangers. He was involved in a number of fire fights whilst serving in 3rd Rangers. In 1970 while under the command of Lt Wong Sing Nang, he was involved in a battle with the enemy at the Dublin Estate in Kulim, Kedah. In October 1973 he killed two of the enemy in the Nonok area in Sarawak. In October 1973 he killed the commander of the 3rd Assault Company the People’s Guerilla’s of Sarawak in the Karangan/Serian area whilst under the command of Captain Robert Rizal. Cpl Mereng ak Imang also successfully laid an ambush with 22607 Ranger Yusof bin Md Isa and 929629 Ranger Edward Kut ak Maon, in the Bunan Gaga area of Serian killing 4 of the enemy. In 1975 he was promoted to a Sergeant.. He left the service after serving the nation for ten glorious years, on the 1st July 1977. He was married to Janin ak Simpu with whom, he had 6 children. Sadly his wife passed away while his children were still young. He remarried, to Lahong Anyie. He is now actively engaged as a contractor in the service industry in Miri. He never used his valor award the “PGB” to gain favors from the government or for that matter from anyone. According to him no one anywhere would know or understand the value of the PGB with the exception of his comrades in arms.